This article is typically (fashionably?) a couple weeks late, though part of it is because I had a hard time deciding what to say about the Mid-Ohio vintage races. There were too many cars to just mention a few and so it seemed appropriate to focus on the event as a whole. I have fond memories of the track. 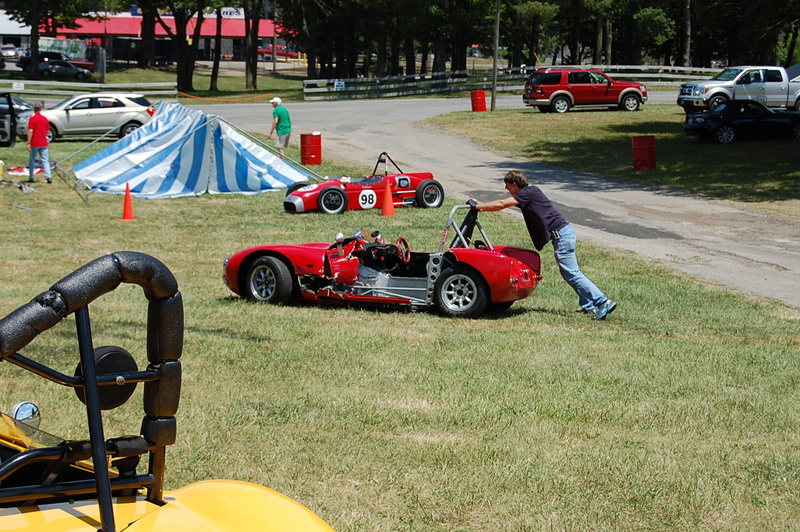 The first race I ever went to was the vintage competition at the Mid-Ohio Sports Car Course. I’m not sure exactly how old I was, but somewhere between 10 and 13 I believe. It was one of those formative events that would help mold me into a “car guy” and even go so far as to influence the very kinds of cars I liked. 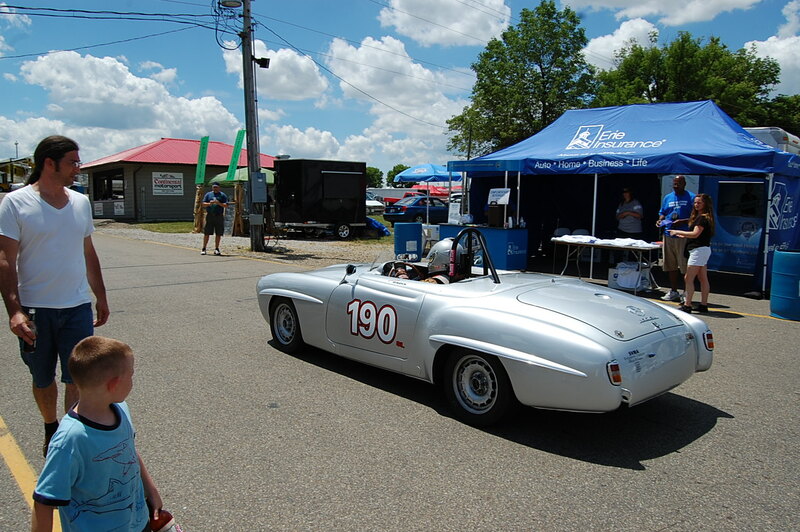 A Mercedes-Benz 190 SL navigating through the paddock captures the interest of a few spectators – some less than half the car’s age. Nestled in gently undulating central Ohio farmland near the town of Lexington, the aptly-named Mid-Ohio track is known for being fairly difficult to drive but spectator friendly. It has played venue to Can-Am events in the 70s, Indy/CART races, endurance races, and for many seasons was the home to the SCCA Run-Offs. In my years of attending races at the track, I’ve seen Montoya and Tracy duke it out in sweltering heat, seen the brakes on a Sunbeam Tiger burst into flames on a cool fall afternoon, seen Porsche 356s roll-over into gravel traps on a pleasant Saturday morning. I’ve even camped on site during tornado warnings, watched Ashley Judd walk up the pit lane, and even met the late Paul Newman – but that, of course, is another story. 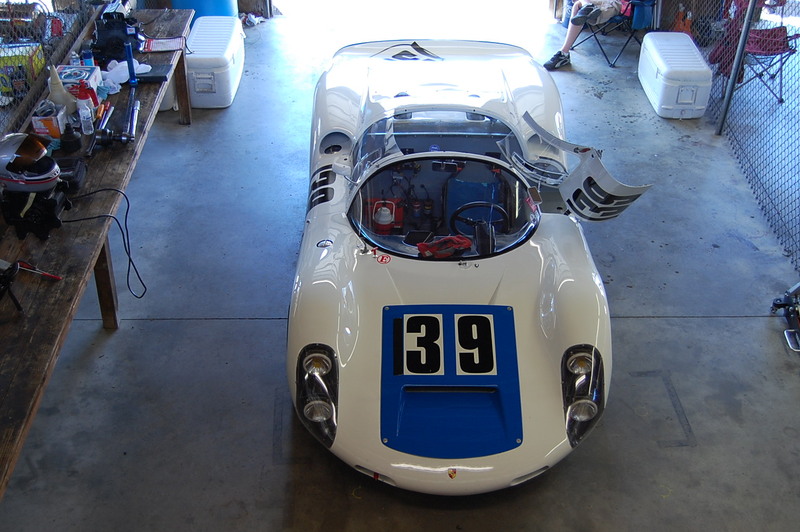 A Porsche 910 viewed from above – spectators at Mid-Ohio can climb the stairs at the garages and look down over the work bays or out over the start/finish line. Mid-Ohio was a sort of pilgrimage for many years but this year marked the first time in roughly 5 seasons that I’ve gone to the track. When I was a little younger, vintage car racing seemed a little more serious. Maybe it was my perception, maybe it was because many of the cars weren’t quite as valuable as they are now, or maybe the people who race the cars are just getting older too. But really, events like the Pittsburgh vintage GP and the Watkins Glen vintage GP had taken the place of the Buckeye State race. An Alfa-Romeo enters the pits – presumably experiencing a rare moment of technical difficulty. The weekend began with practice and qualifying on Friday, with each class having two races on Saturday and Sunday. (Classes are determined mostly by engine displacement and vehicle type – e.g. open-wheel, production car, purpose-built race car, etc) This year’s vintage races and accompanying car show rather unenthusiastically featured British cars in general. 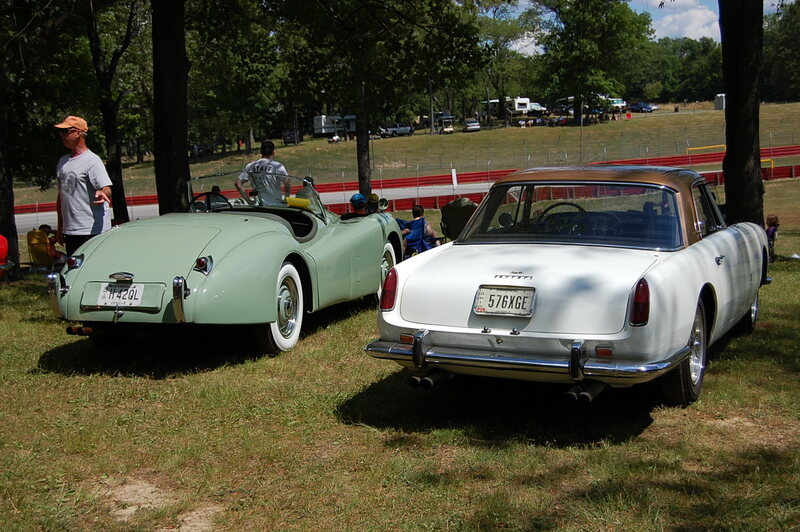 No specific marque such as Triumph or MG as in past years or at other similar events. It almost seems as a bit of a cop-out considering the high percentage of British machines always present at most any classic car function. 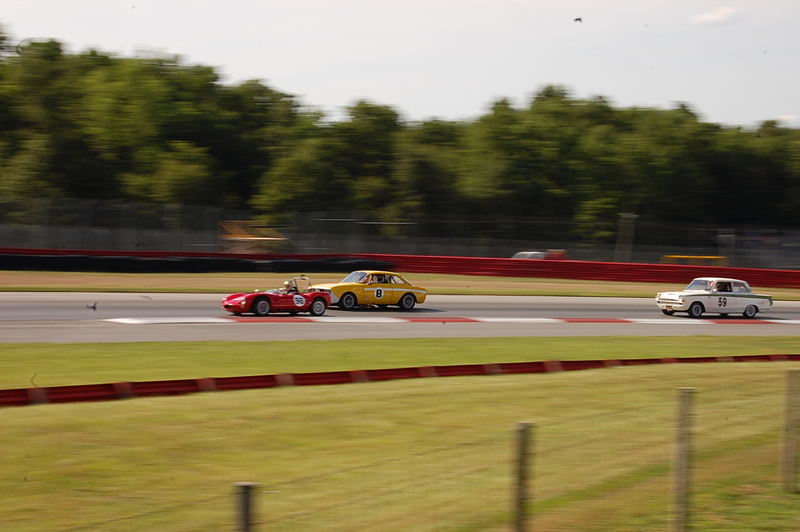 To confuse matters a little further, the understated Anglican highlight was interrupted by an Axis powers themed “feature race “held on Sunday afternoon which was intended to pit the Alfa-Romeos, Datsuns, and BMWs together. 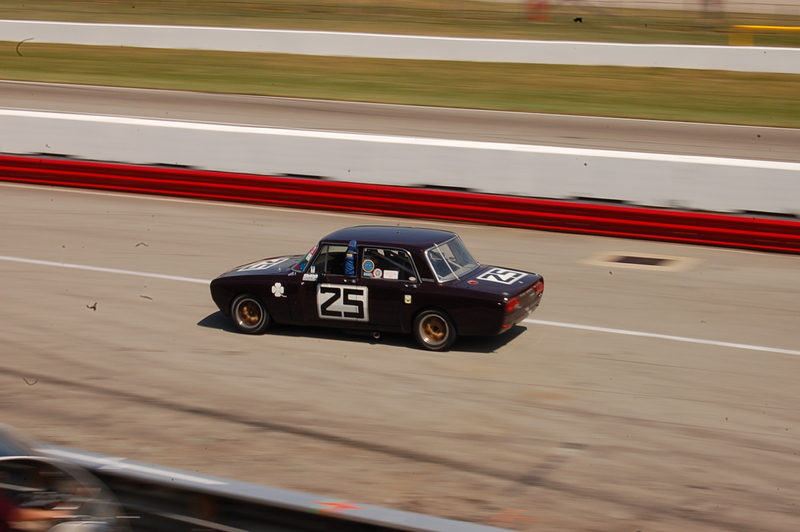 The field was rather small, mostly made up of Alfa Giulias, peppered with Datsun 240s and 510s, and a lone BMW E-30 that took third place. All weekend, but particularly on Sunday, a fairly decent car show is held in the infield for not racing vehicles. Spectators personal vehicles scattered about can be just as interesting at times. A Jaguar and Ferrari share space on the grassy knoll and vie for attention from the racing machines. Some of the more interesting races were the two “endurance” competitions lasting 90 minutes each. 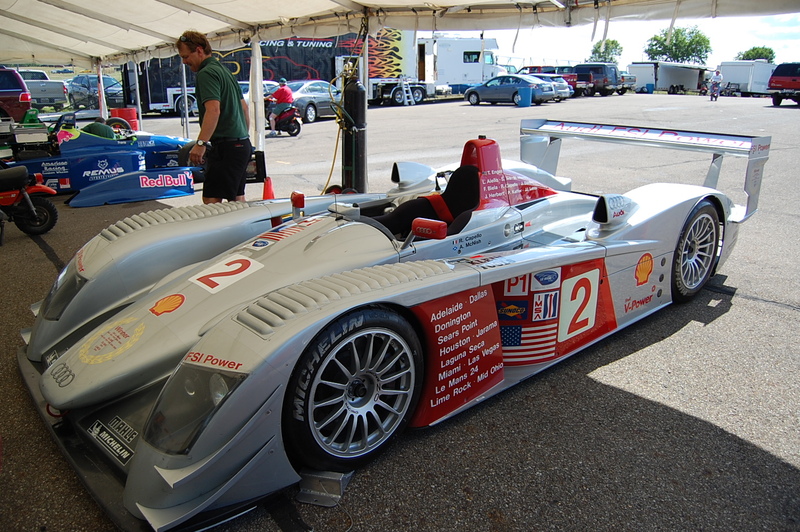 The cars which participated in each race were from various classes, though the slower groups ran in the first race while the faster vehicles ran in the second. Again, the racing itself is fairly casual, but it was most interesting to see differing cars running with one another. Hard to call it vintage, but this LeMans winning Audi R8 has been making the rounds on the vintage racing circuit for a few years now. Regardless, its always very interesting to see up close. It may be worth noting that while the racing can appear tame, there some competitors may be a tad presumptuous. One particular Budweiser-liveried, ex-Rahal Can-Am car took its place on the false grid with no less than five “team members” to support the effort. Mind you, this is a vintage sports car race – there is no grand prize of money, no television cameras, it’s not even a long race. But I swear, there was one guy who’s job it was to hold an umbrella to shield the driver from sun. One can only wonder how the other drivers were able to sustain themselves in the summer sun with nothing but will power and a layer of Nomex. 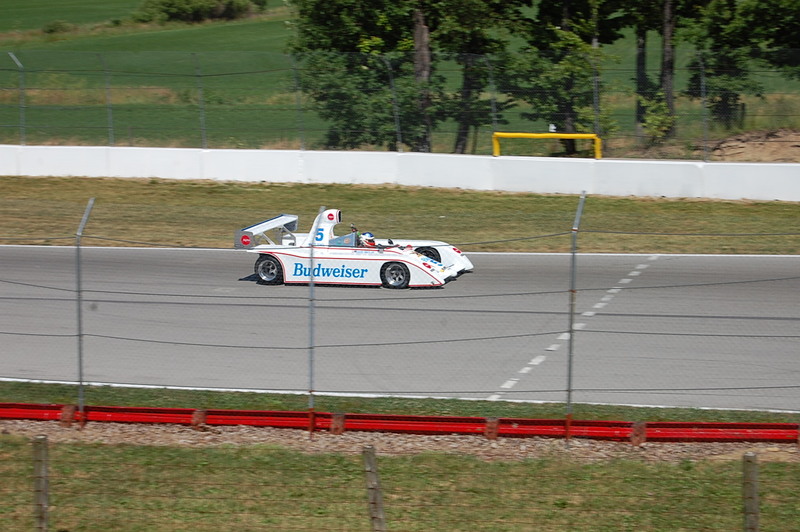 I am still a big fan of vintage racing and still enjoying as much as I did as a youngster attending my first race at Mid-Ohio. However, I must admit that this particular event has lost much of its allure. Within a few hundred miles from Mid-Ohio, Pittsburgh and Watkins Glen have their own excellent events that have a more vibrant air about them. I will not go so far as to say Lexington’s effort is not worth attending, but if you’re trying to choose, keep in mind you’ll see many of the same great cars (and many others) elsewhere. Ian, I read with interest your article about the Ami 8 in remarkably good condition,would you be kind enough to let me know the details on the casse auto please.